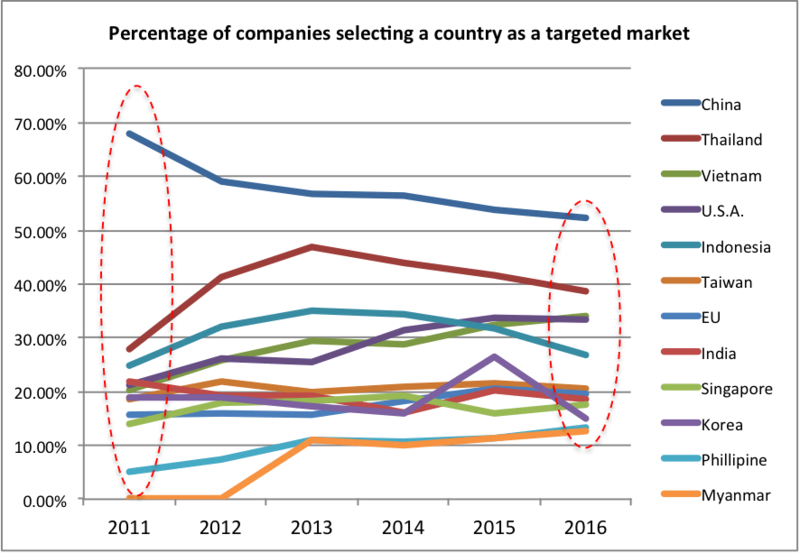 Japanese companies have been continuously shifting their global business coping with the ever-changing business environment: rise and fall of the global economy, a sudden change in politics, an advent of disruptive technologies, and unpredictable quick changes in the market. These changes are obvious when we look past. But quite difficult to see when in present. In this article, we will look into some of the signs of change in the Japanese global business which may give you a hint for your new business in Japan and beyond. In past 1 year, more than 10 percent of Japanese companies have shifted their production base back to Japan, according to the survey of Japanese companies conducted by METI. This is the third year in a row that the figure passes 10 percent line. METI believes it’s becoming a stable trend. Among the countries shifted from, 66 percent of the shifts were from China and Hong Kong, followed by 6 percent from Thailand, and 5 percent from Indonesia. 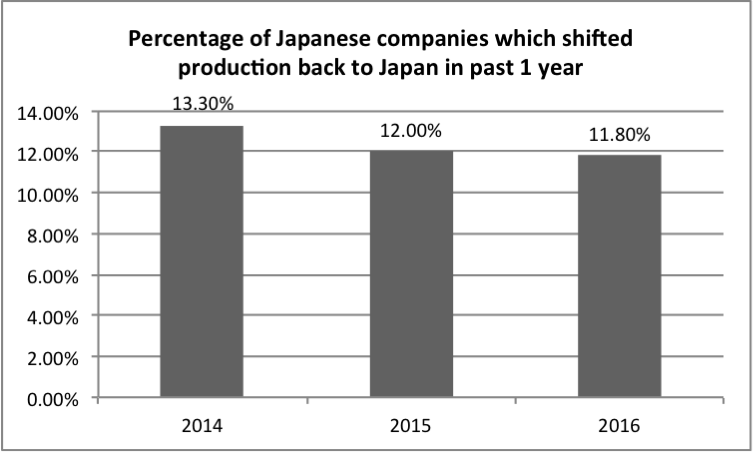 In 2016, the pace of production shift “from China to Japan” has outpaced the shift “from Japan to China”. The survey reveals several reasons for the change. It indicates some crucial signs of altering Japanese global business. An overwhelming decline in Japanese yen was the top reason for the shift. Japanese yen went as high as $1=¥75.54 in October 2011: the highest level in the history of Japanese yen. However, it started to decline steeply in the 4th quarter of 2012 after Prime Minister Abe introduced Abenomics, a multi-pronged economic program to improve Japanese economy. In 2015, it reached the level of $1=¥125.85: a devaluation of more than 66 percent from the peak. This significant change of exchange rate caused disruption in cost structure. Manufacturers who sought to import products from their assembly factory in China faced a sharp increase in the costs. As a result, they were forced to bring back production to Japan. Another crucial reason was a surge in labor cost in China. Exchange rate could be a temporary issue but the sharp rise in wages could be a permanent matter. 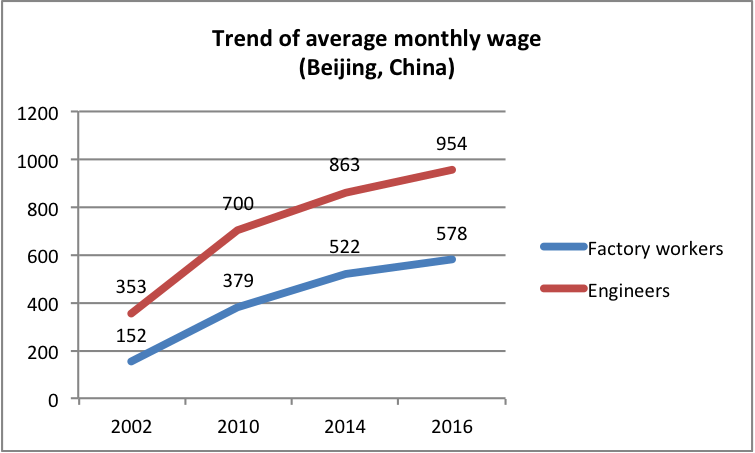 In the past decade, labor costs in China have increased significantly. In Beijing, the average monthly wage of a factory worker was $152 in 2000, which rose double to $379 by 2010. The level of monthly wage in Beijing is now two times higher than Jakarta (Indonesia: $257) and three times higher than Hanoi (Vietnam: $181). A sign of structural change? For decades, Japanese companies have shifted their production to China to win competitive edge in a globalized economy. Now, the tide may be changing. The global business environment has changed drastically in past few decades. The globalization gathered manufacturing to China. Now the same globalization seems to make the manufacturing diversified and localized. See the article on localization in Japan: How to take advantage of localization in Japan? What affected negatively on one side benefited the other. Weak Japanese yen provided a huge advantage for Japanese export business by helping them sell products globally at a competitive price. Now, Japanese companies are becoming much aggressive in expanding export businesses. This trend is also true for SMEs. 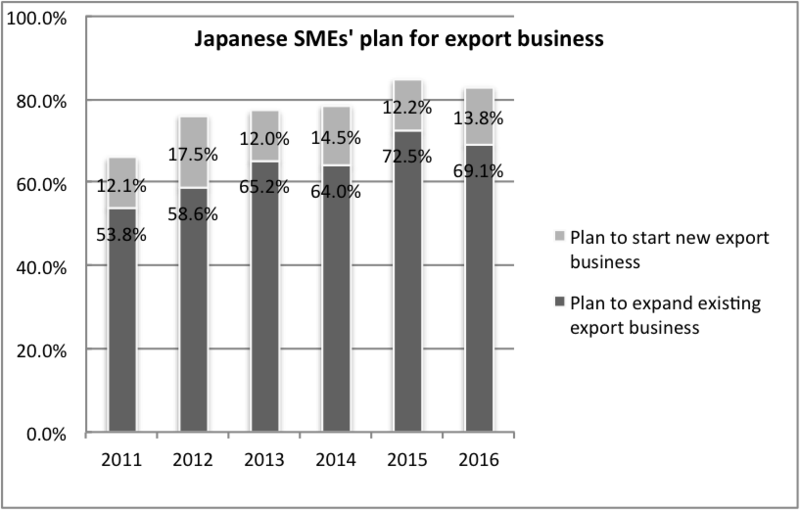 More than 80 percent of SMEs are now planning to expand their export business in coming few years, according to the survey done by JETRO. One of the changes we are seeing is increased diversification. China still has the most interest, but there are growing interests in other countries. 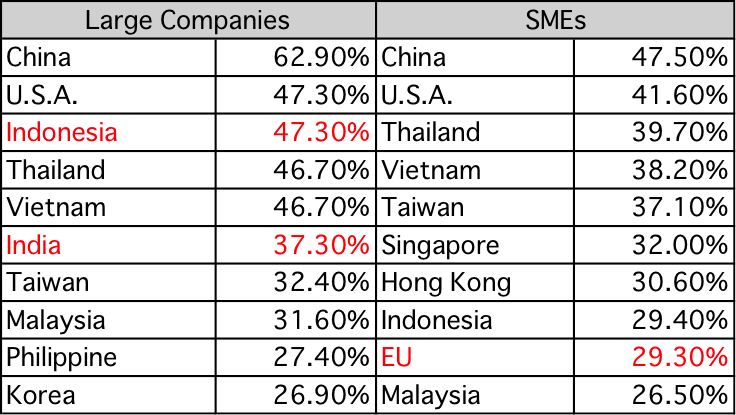 The large corporations tend to prioritize countries such as Indonesia and India higher, a large market but less sophisticated, while SMEs prioritize countries like EU, matured but less dynamic. This may reflect the contrast in resources and capacity they hold. Large companies have the capacity to take risks and resources to mitigate them. On the other hand, SMEs, with limited capacity and resources, have to play more conservative, which may lead to preferring relatively matured market. Apart from export, there are also rising interests in entering and expanding business abroad. One area to check closely is the move of SMEs. Traditionally, Japanese SMEs have been conservative when it comes to international business. For a long time, they have built their business within the domestic market. Feeling safe and stable being part of the larger companies’ supply chain, they didn’t feel any urgency to go out of Japan. However, their business environment has changed drastically. They find their market shrinking and large companies are not so reliable anymore. On the other hand, they think more opportunities are growing beyond Japanese market. According to JETRO’s survey, more than 50 percent of the SMEs are now willing to expand their business abroad. 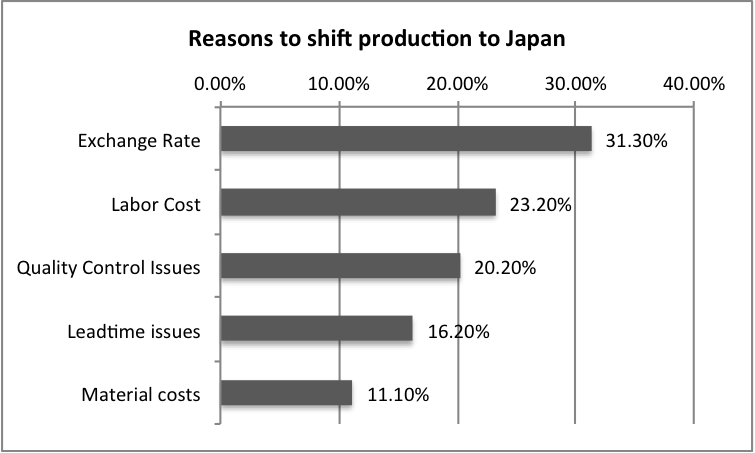 However, it is not so easy for Japanese SMEs to deal with market out of Japan. To support these SMEs, many initiatives have started by the Japanese government. Although still early to tell how it goes, this trend will likely to continue. Here we are seeing the diversification happening as well. China has been the top country for years but the interests in the other countries are growing. Countries such as Philippine, Myanmar, and Bangladesh have newly joined the list. Instead of everyone heading to China, Japanese companies are gradually putting their eyes on other countries. “Diversification” is the keyword to understand the current global strategy of Japanese companies. They are more open to new opportunities and willing to take risks. But the progress has just started and there are many challenges to overcome. Dealing with the new country and market is not easy for any company, especially for those used to do business within the domestic market. Japan has been known as a difficult place to start a business for foreigners. However, as the mindset of Japanese companies is gradually changing, foreign investors and entrepreneurs may find more opportunities to work together. Although nothing is easy, there are signs of improvement. Another keyword is “business alliance”. As the market and production become diverse, a business collaboration between Japanese companies and global partners is essential. Combining the strength and covering the weakness, there shall be more win-win collaboration in global businesses. In order to promote the global collaboration, there needs to be a better way to search, find and evaluate the potential business partners. This is especially true for SMEs. A better platform for communication, transportation, and finance is also necessary. We need to think and test various ideas to find ways to connect the unconnected. Although TPP was rejected by Trump administration, we still see FTA (Free Trade Agreement) progressing between many countries. We saw EPA (Economic Partnership Agreement) between Japan and EU has come to final stage this month (July 2017). Each sign is subtle and small. But it does show progress. Be ready to see a breakthrough in Japanese global business. Tokyo Fabhub is a network of more than 50 factories in Tokyo, Japan. We facilitate international collaboration for business development in Japan and beyond in manufacturing products and parts.